When the nights get shorter and shorter and the stars get brighter in the frosty night sky I know Christmas is getting close! And that means decorating! 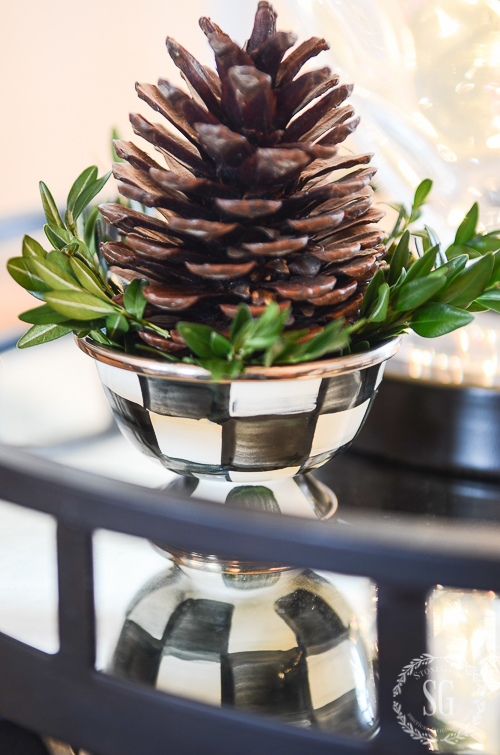 Lots of bowls of greens and pinecones and little trees and stars. 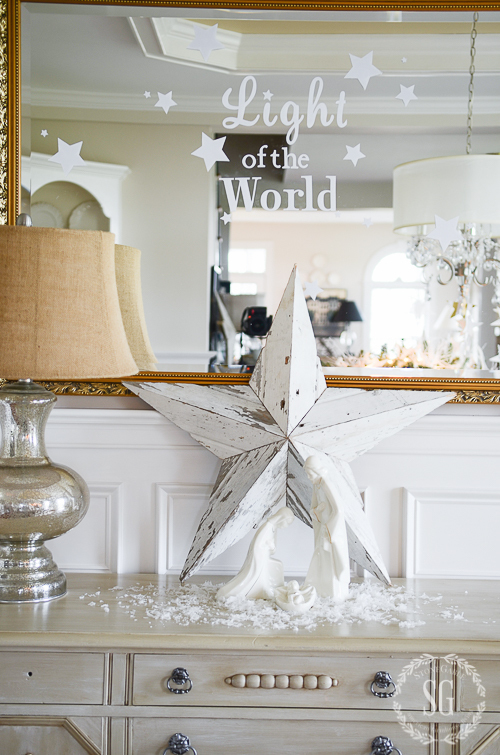 I’m filling my home with stars… big and small! And tiny white lights play a big part in this years decorating too. They give StoneGable a magical feel. Why am I telling you this when you can see it for yourself? 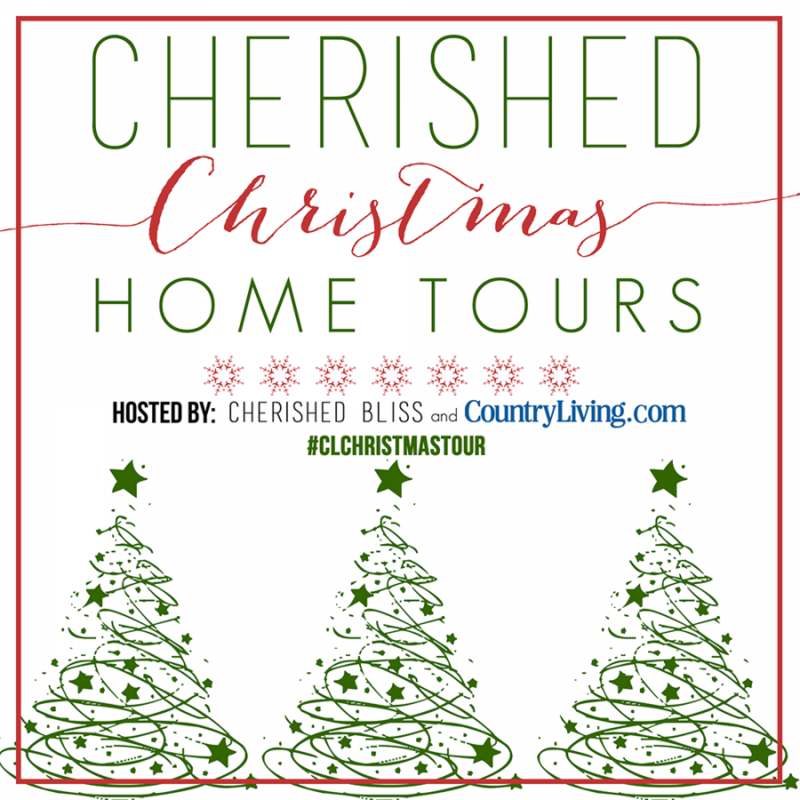 A big thank you to COUNTRY LIVING and Ashley from CHERISHED BLISS for sponsoring this Christmas house tour! To see the very beginning of the tour, start at Cherished Bliss and follow it along to each blog. If you are coming from SHADES OF BLUE INTERIORS, the blog before me on the tour, thanks for stopping by and welcome to StoneGable! Today I’ll be showing your my downstairs. 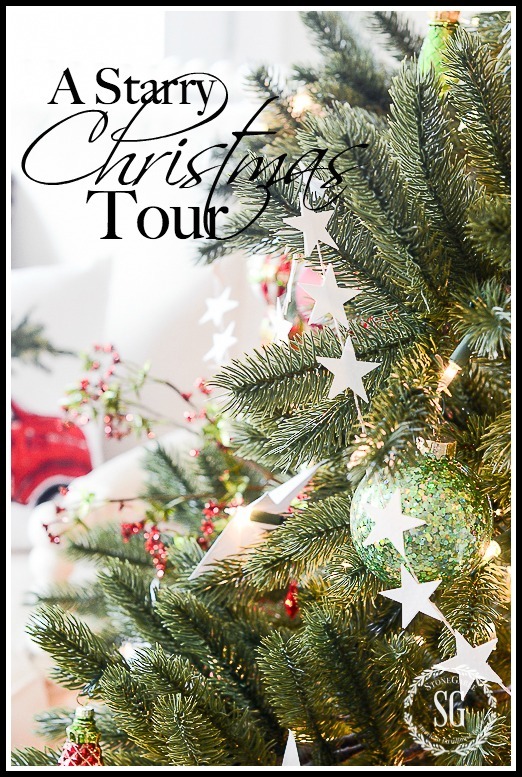 Stop back next week to see a detailed Christmas kitchen tour, a Christmas outdoor tour, a Christmas bedroom tour and a very special Christmas Tablescape! The family room is is relaxed and lived in! This Christmas I’m decorating most of the house in with a more traditional vibe than in years past. I have missed that classic look! It’s sorta nostalgic with lots of reds, greens, gold and a bit of dramatic black! 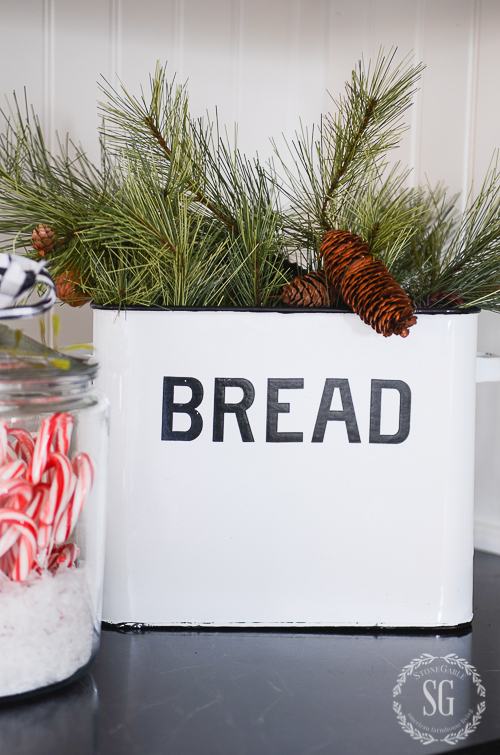 Instead of dumping the sleigh of decorations in my home I’m fitting them into the decor I already have! My family room is a good example of my Christmas philosophy this year! 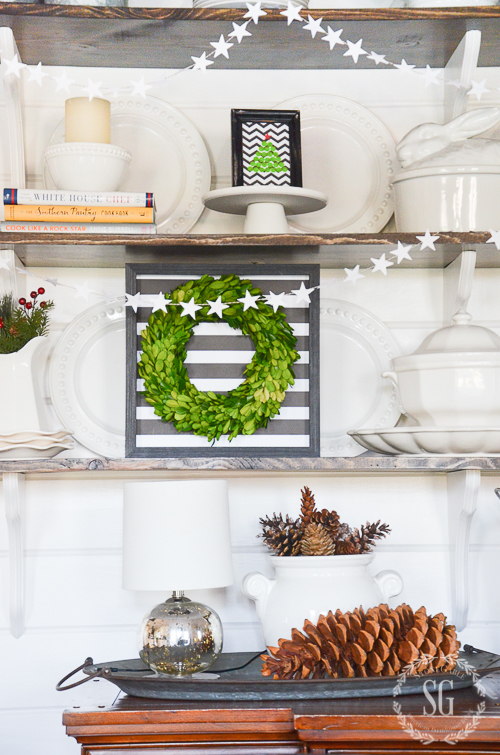 The breakfast room aka the eating area is gently decorated in greens and whites and black… my very favorite color combo. I kept the table clean and less cluttered because the open shelves across from it is all decked out and bespeckled with stars! 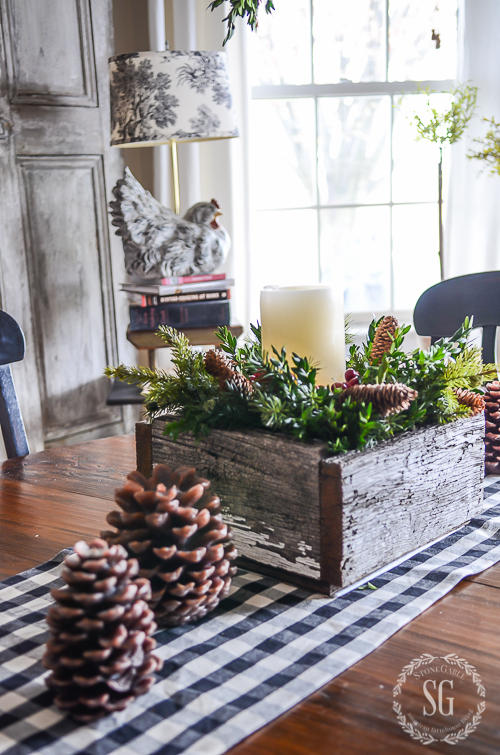 Stop back tomorrow to see how to make the table centerpiece in about 10 minutes! 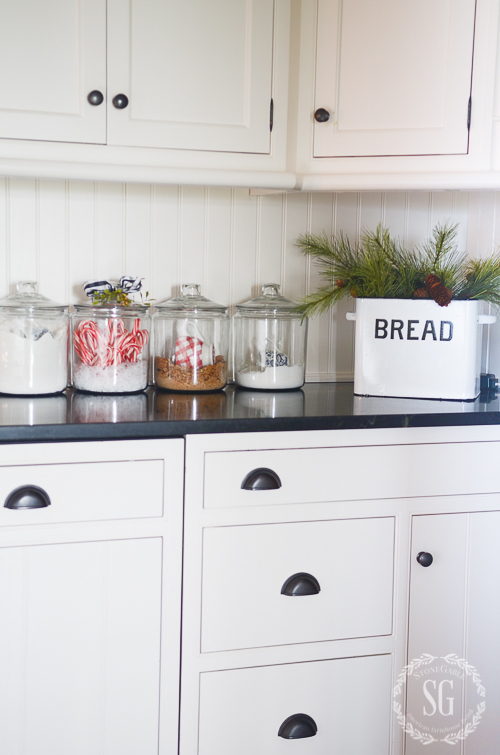 I always say that my kitchen is the workhorse of my home and for that reason I keep my decorations minimal. I love love love lemon cyprus trees. I’m using them all over the house this year. They make a grand statement on the island! 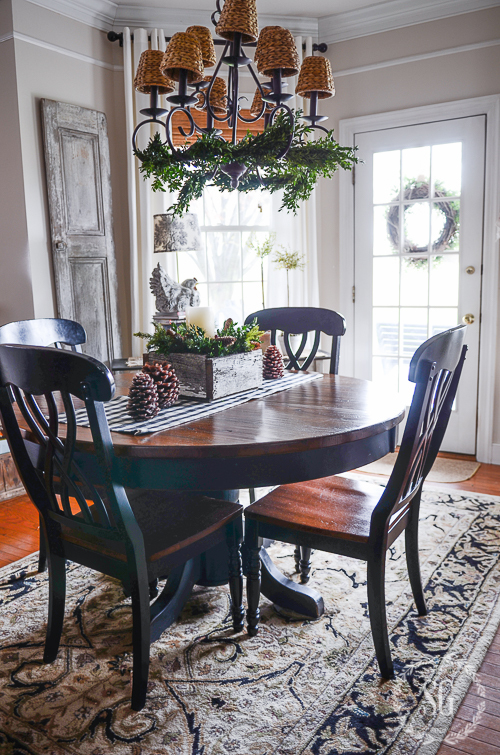 This grand sleigh steal the show in the dining room! 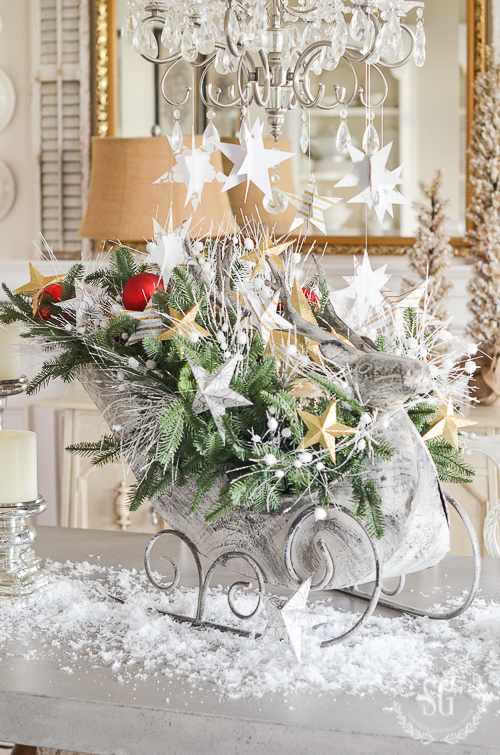 He is filled with greens and ornaments and stars… lots of stars! A milky white nativity finds its home in my dining room this year. This is the “tree” room this year! This room has a happy, classic mood! 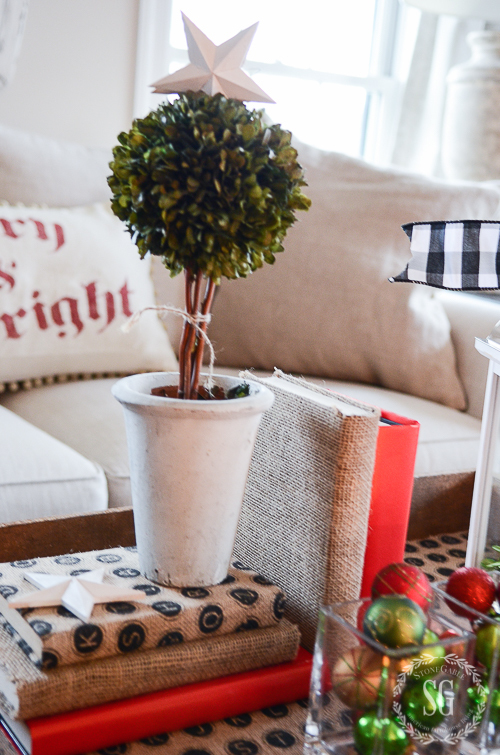 It’s where we will spend Christmas day reading the Christmas story, opening presents and being with family! I can’t wait! I hope you have enjoyed the tour and have been inspired! And I hope your home is filled with gifts you cannot buy this Christmas… love, peace and joy! You are in for a real treat! 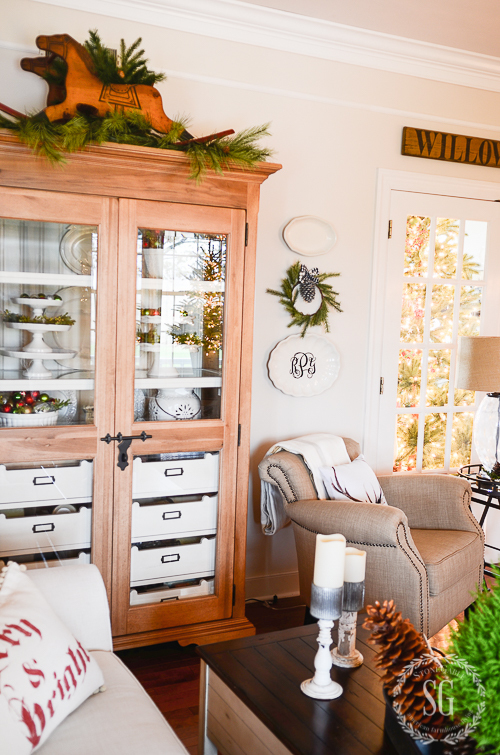 The next stop of the CHERISHED CHRISTMAS HOME TOUR is Emily’s THE WICKER HOUSE. Emily’s 90 year old cottage is open and airy and has a costal, bohemian feel. You will love it!!! 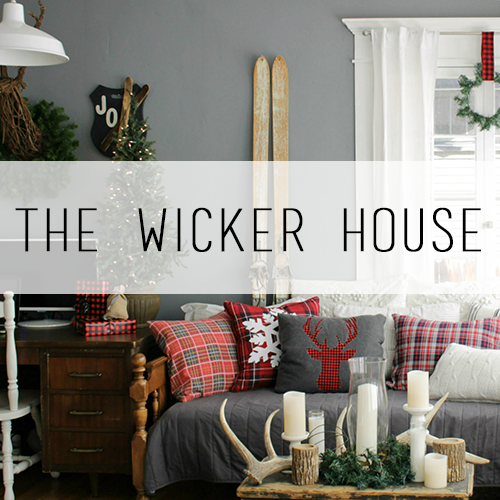 The next stop on your tour is THE WICKER HOUSE! 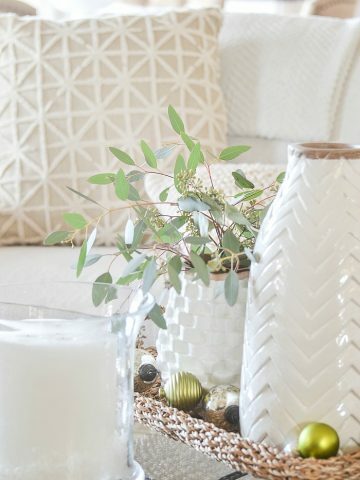 Remember to follow me on Pinterest and see all the great things I’m finding to pin HERE! Yvonne I loved everything you’ve done! It makes me feel ready to move on from fall! And I know it’s time but I was really enjoying the fall decorations. I bought a die for my Big Shot last week in hopes of making stars for decorations. Wow! You made some starry magic here. Anyway I have a question about the lemon cypress trees. Are they real? I had some similar last year and they all died in a few weeks. What do you do? Thanks so much for the inspiration. Happy and peaceful Advent to you at Stonegable. Oh. My. SO stunning Yvonne!! I wore out my pinning button! I love all the hits of colour and all the incredible styling details. You did an amazing job making your home feel cozy and welcoming and family friends but elegant, classic, and timeless all at once!! Excellent job as always ! Love your use of greens and Earl is sooooo handsome! Love your packages under the tree! Spectacular Yvonne! Great job!!! Karen, Right back at you! What fun! You were the highlight of my evening! Your downstairs is beautiful!! 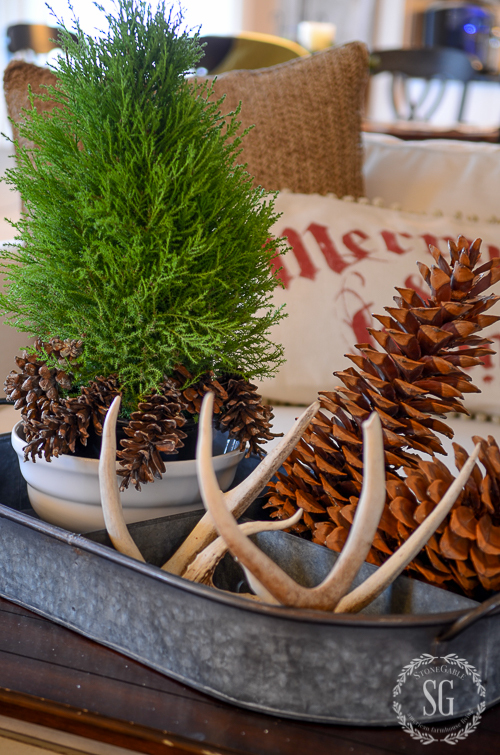 Brought back memories of a friend who had her entire home decorated by Thanksgiving day!! Her formal tree was in the living room, all three kids had their own tree in their room,parents had a bedroom tree, too. The family tree was is the den, even the bathrooms were decorated!! The front porch, back deck and yard were also done!! The week end after Turkey day she held an open house for 300 and made all the foods!! I’m betting your yard is as beautiful and the upstairs will be amazing, too!! Patiently waiting for next week to see what else you’ve done! 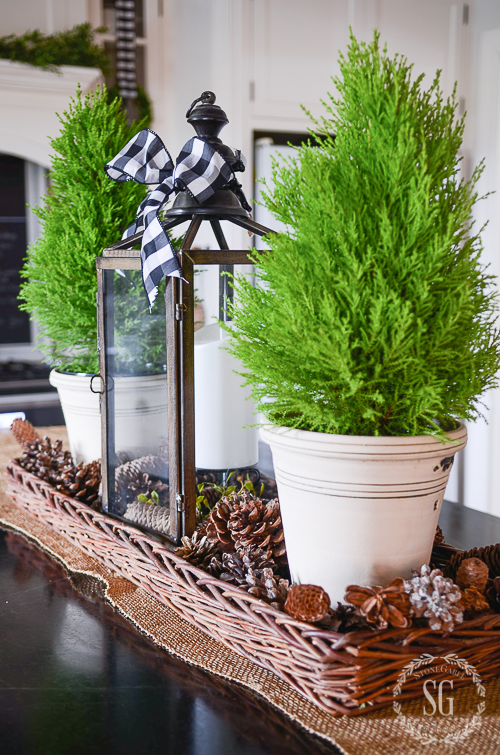 Wow- you’ve brought “Deck the Halls” to a whole new level- it’s all gorgeous! I have a sweet nativity set that I’ve hesitated to use the past couple of years- the colors seem odd with a lot of pink and yellow. You’ve given me the idea to spray paint my set white! Can’t wait to try this- thank you for the inspiration, Yvonne! Thanks! This is the best house on the tour- you have fabulous talent and an incredible attention to detail! I love all the stars! They are so simple but so beautiful. Your home tour is stunning. Gorgeous, gorgeous decor! 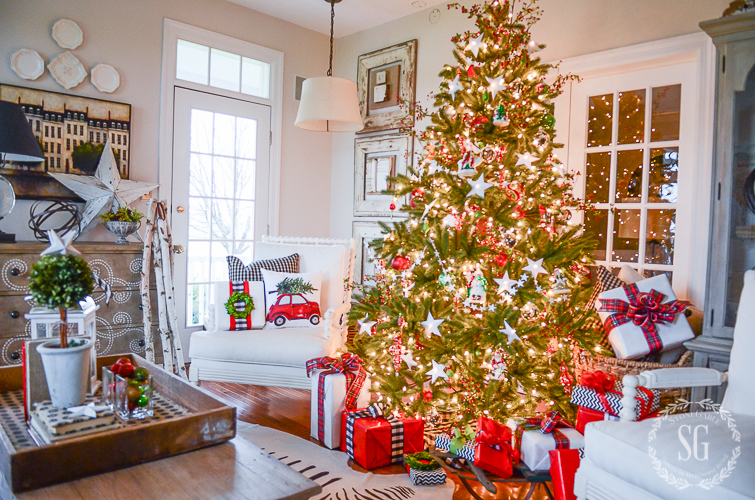 I especially love the scene with your beautiful tree and the cozy and pillows. So pretty! Really lovely and not over the top and yet inviting and festive. 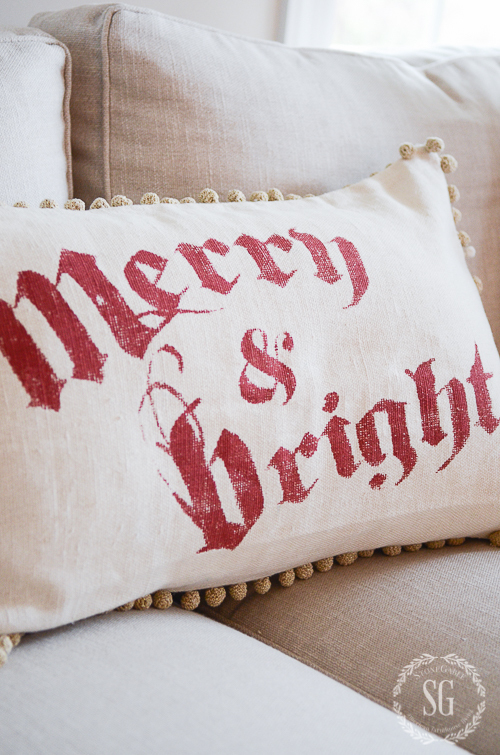 Where did you find the Merry &Bright Pillow?? Hi Nanci, It came from the Pottery Barn Outlet. Your house looks absolutely darling. That vignette with the aprons is so clever! Loved the entire tour! First off congrats!!! For getting to be apart of the country living Christmas . I love your rooms. And your tree is beautiful,I m so crushing on the stars. Can’t wait to see more of your house. You have done such a wonderful job with the decorating again this year! Congratulations on the feature at country living and at balsam Hill. P.S. Thank you so much for your sweet and thoughtful comment on my blog post the other day. I so appreciate your prayers and encouragement and will be praying for you too my friend! I just love the two of you to pieces!!!! This is beautiful! 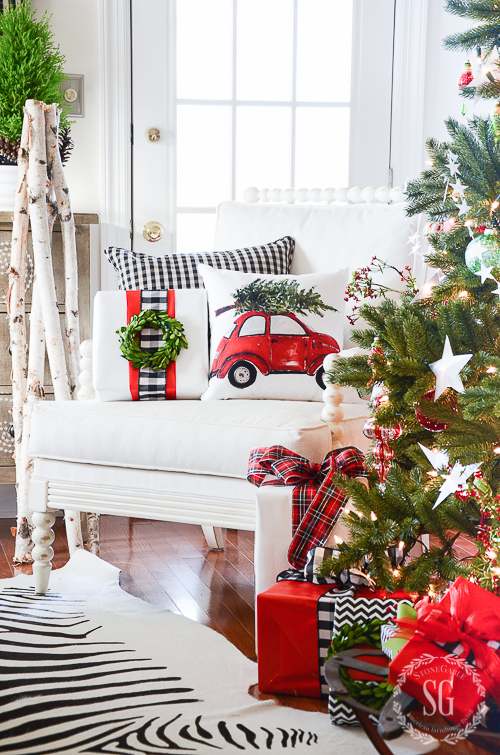 Where did you get the pillows with the wreath and the truck with the Christmas tree? I need them in my life! 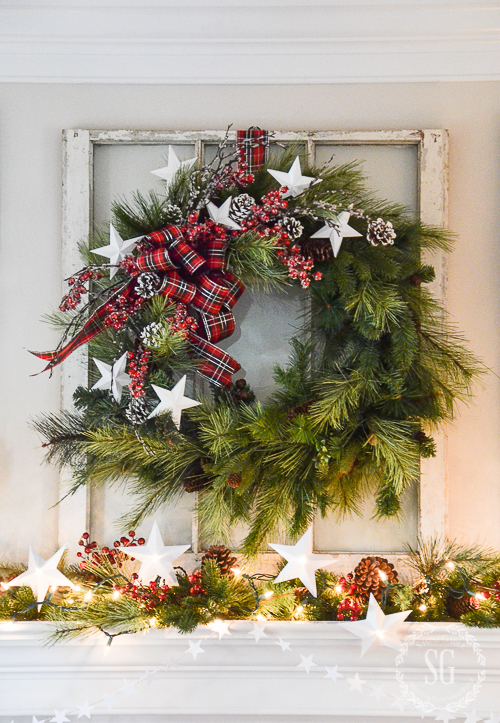 The wreath pillow came from Pottery Barn a couple of year’s ago. 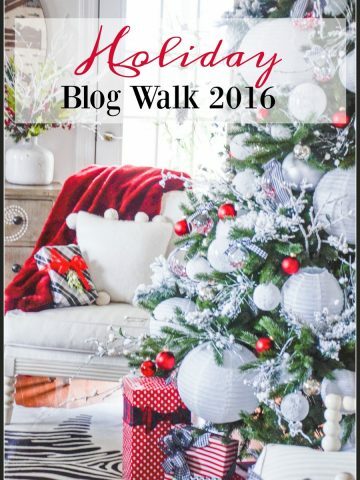 And the VW with the Christmas tree is art from my friend Lucy at Craftberry Bush… http://www.craftberrybush.com/.You can find her art on pillows at Society 6 online. Hi Tiffeny, I got the rug from Ballard Design. It’s wearing so so well. I highly recommend it! Wow! You have decked the halls in a big, beautiful way! I just love everything you have done. I have my nativity in front of a mirror too, and was wondering whether you used a stencil to write Light of the World, or bought sticker letters? I can’t wait to tour the rest of your Christmas home. I do not have a blog yet, but every time I see your latest creations, I am inspired to start one! 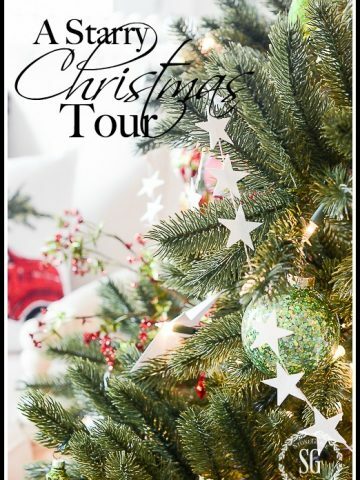 Your house is always beautiful, and your christmas tour is one of my faves if not my favorite! 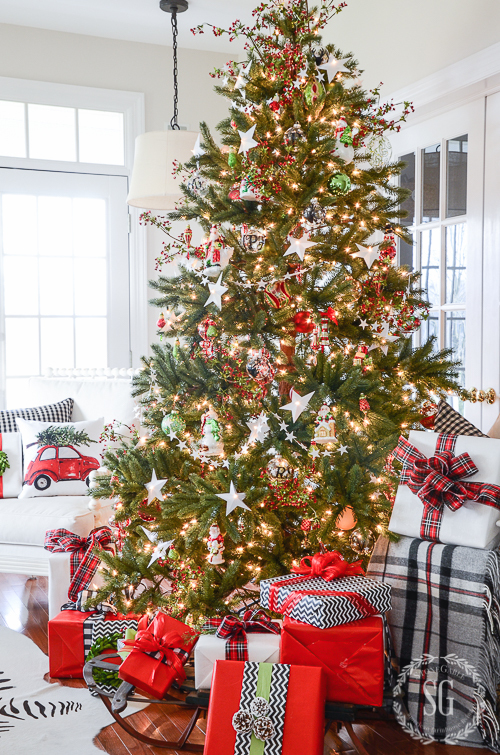 The plaid tree is so pretty. Thanks for the inspiration. Jeanne, DO IT! You won’t regret it! I have met so many wonderful people! It’s the best job in the world! I was hoping for a relaxing experience looking at a beautifully decorated home. Then all the adds started popping up in my face from every direction and made me nervous so I quit watching. Sorry about that. But without ads StoneGable would not exist. I could never produce a blog of this quality with my home budget. I work over 60 hours a week and spend $$$ a month on things like site management, bandwidth, tech agency, photography equipment, props,newsletters, viraltag,image editing software, internet host, an assistant, new content and so so much more! There is so so so so so much more to producing a daily StoneGable post than just taking pictures and writing. I hope my readers enjoy StoneGable and can overlook the ads. Hope you will reconsider! Lovely as always, using what’s natural just makes it the best!! Hi Yvonne, what a beautiful home.. I love your inspiration. Could you give an opinion of porcelain kitchen sinks? I’m considering purchasing one for my new kitchen. I had one years ago and it was very nice but there is upkeep. I’d go online and read some reviews. Can I move into your home?!?! So beautiful as always Yvonne. You are so incredibly talented. Your home is a joy to see! Wishing you and your family a blessed Christmas. Yvonne, everything looks beautiful, but your tree… is spectacular!!!!!!!! Gorgeous as usual! 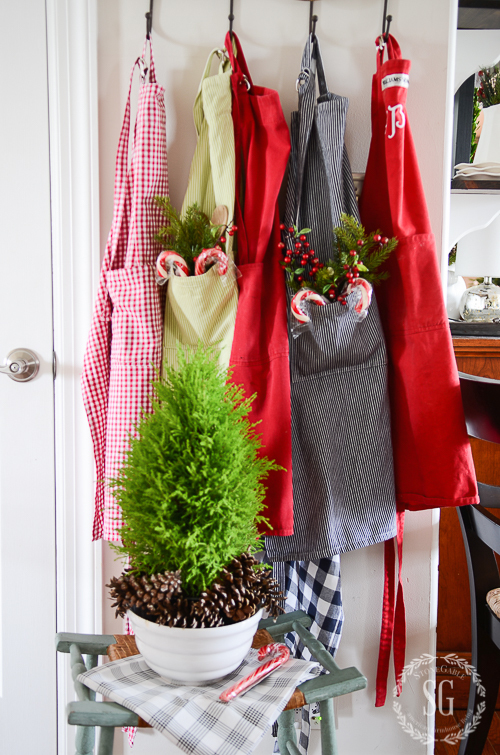 Love the candy canes in the jar and the sweet apron vignette. Just beautiful! Lemon Cyprus can live very well in a house. They need light and LOTS of water. If they get dry they die. 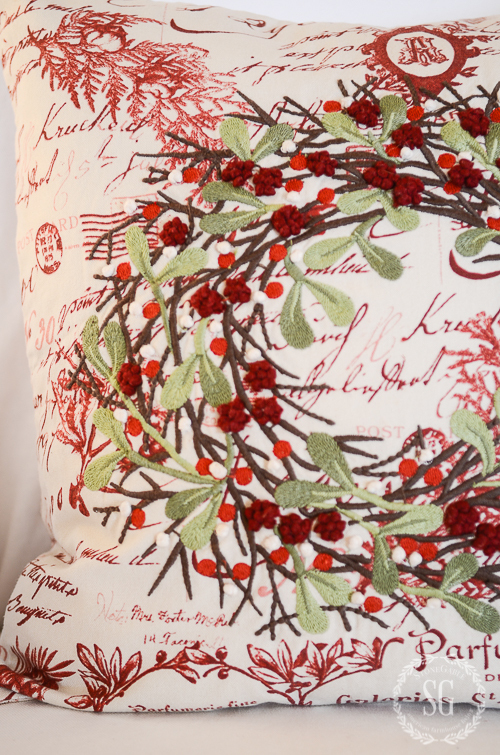 Love your style – Where did you get your red toile holiday pillow? A must have. Merry Christmas. What joy to my heart you bring. I found the red Christmas pillow at the Pottery Barn Outlet several years ago. Hope this helps! What a gorgeous home you have created. Thanks so much for sharing. Very inspirational, too. Love, love, love your house! Everything looks so wonderful. 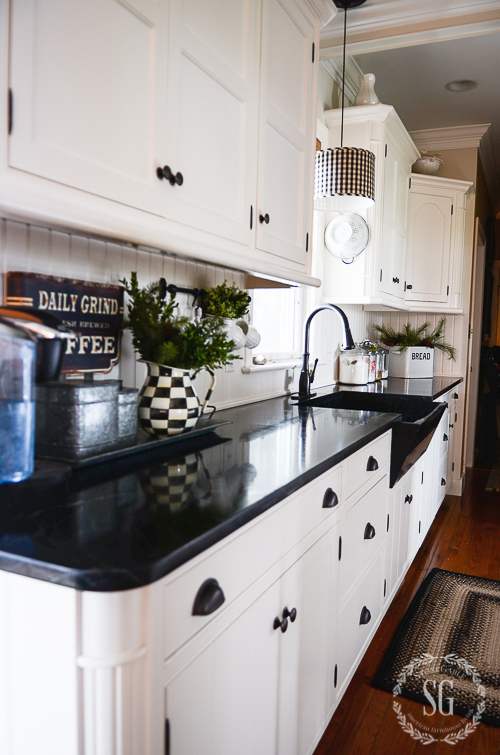 Where did you purchase your kitchen rugs? I need new ones and can’t find ones I like. Black is my color. Thank you and Merry Christmas! I got it at a local shop. The Old Millhouse Shoppes in Lancaster Pa. 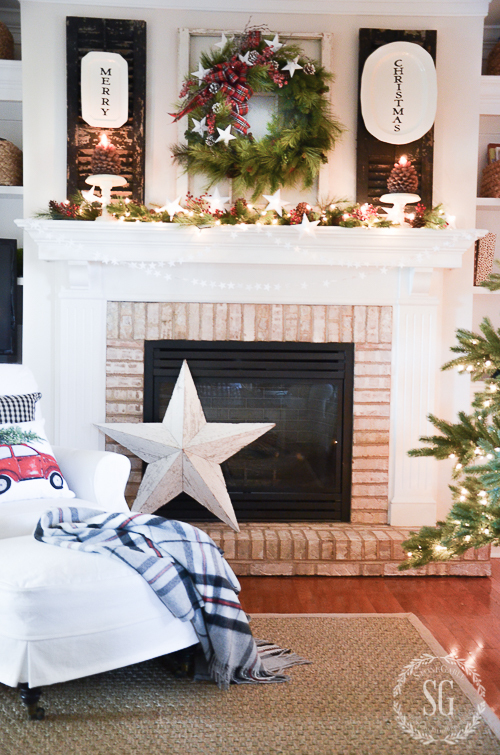 Your home is beautiful and if possible, even more so at Christmas. 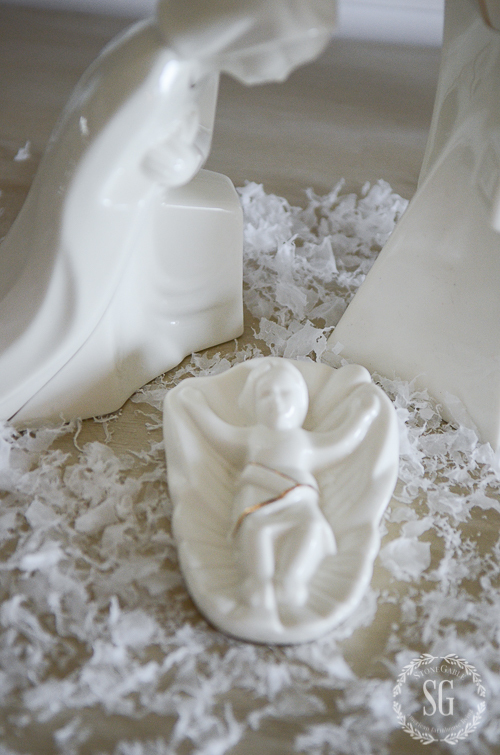 I love the white nativity set. Merry Christmas! 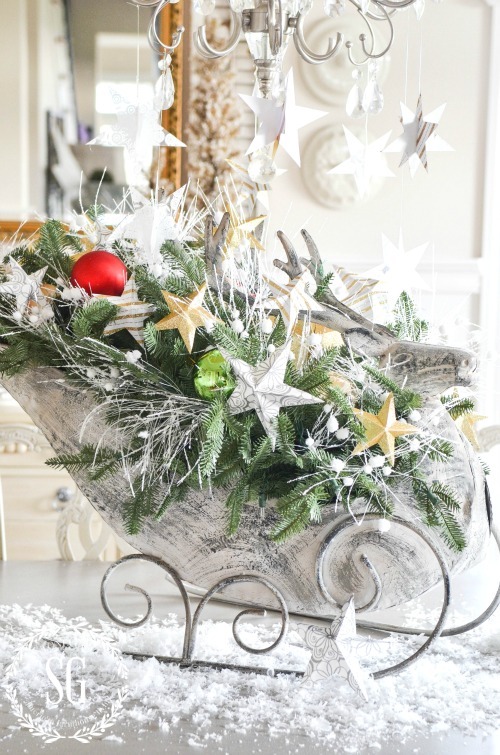 The sleigh came from Luckett’s design house about 3 years ago. Can I come live with you?? Love your style so very much…. I’m clapping my hands for your photography! 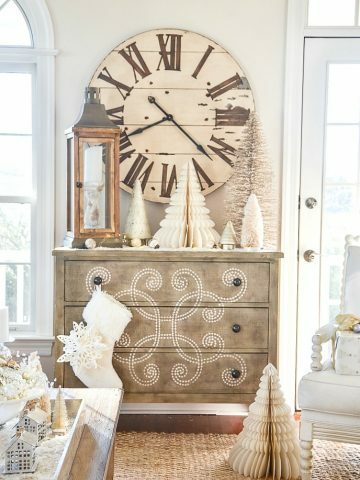 LOVE that you started with a picture of the entire room, then zoomed in on the details! 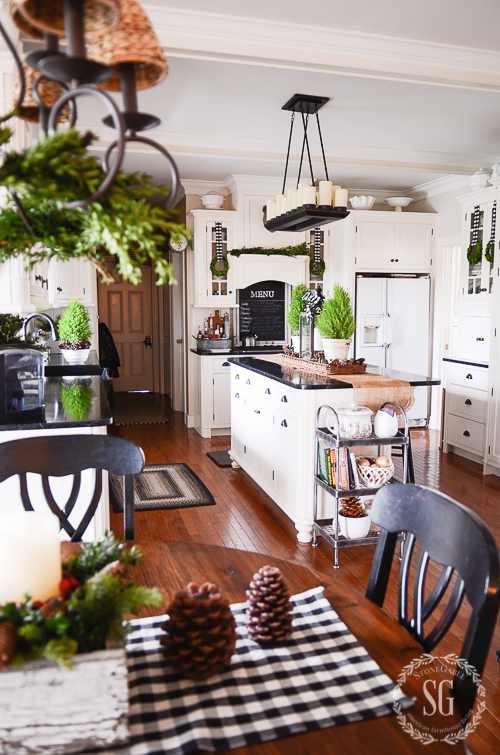 “Can’t see the forest for the trees!” Your kitchen is always my favorite! Aren’t the nights getting longer and the days shorter? Where, OH where, can I find the white nativity scene? ANY nativity is difficult to find! Please share your source. Beautiful as usual. I share your pleasure in the small lemon cypress trees. 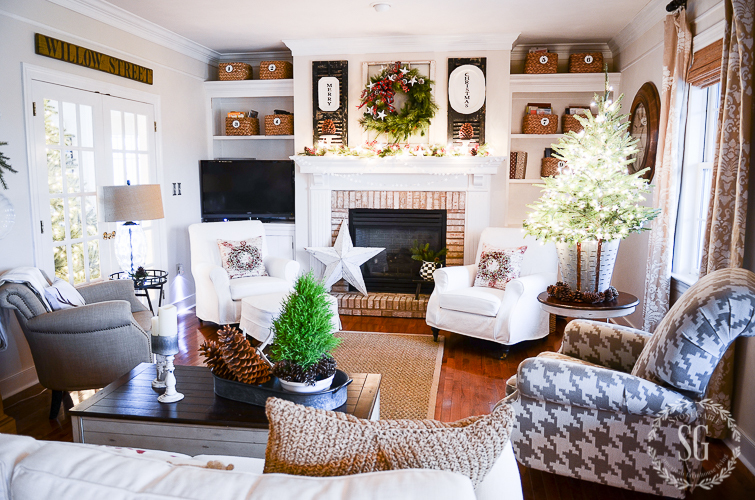 SOUTHERN LIVING magazine, December, has a guide of live, small trees. Check it out! Looking for a gift for a shut in – one of these trees or a small container of paper white bulbs. Both bring joy! Thanks for having us on your tour. Don’t forget the beauty of spray paint, Nan, as it can work wonders! Look in dollar and reuse stores. If you’re out of luck this year, watch for post-Christmas sales (as people tire of their decorations after Christmas and donate to reuse shops) then you’re ready for next Christmas! Hi Nan, I got the Nativity as a gift a dozen or so years ago! It came from Mikasa! Yvonne, I just knew your home would be spectacular and so inspiring. 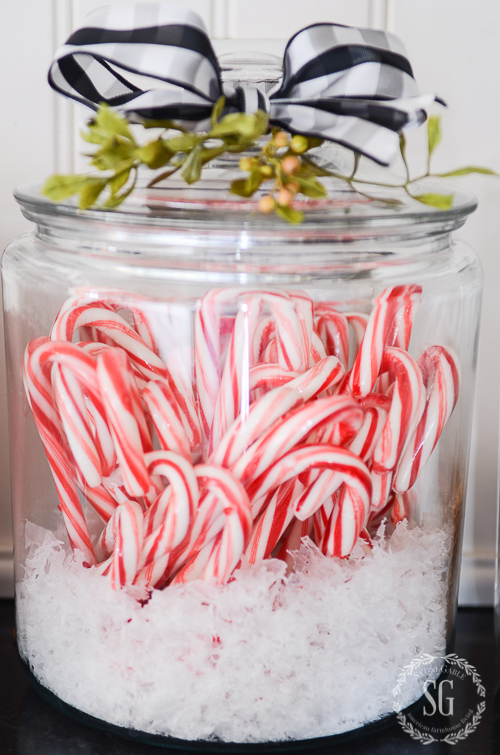 I love all your special little touches, like the candy canes in the glass canister and in the aprons. I almost feel like a little kid in a candy store…so much to take in and to be mesmerized. Beautiful! Thank you for sharing! Merry Christmas to you and your family!! Simply stunning, Yvonne. Loved the tour! It is beautiful…. all of it! 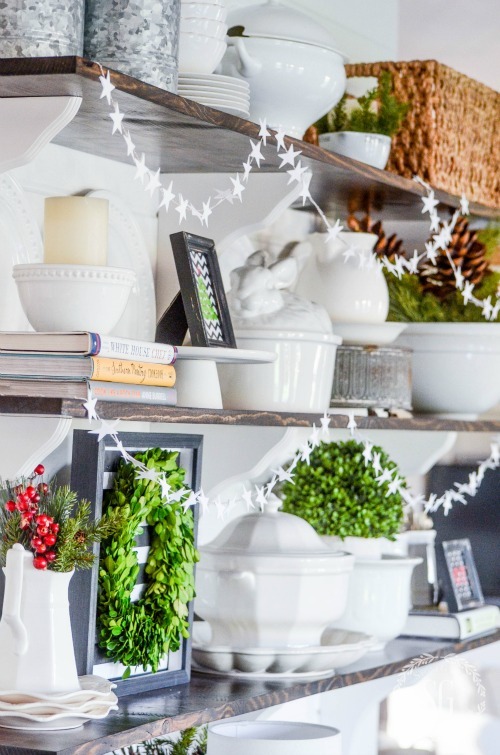 Love your Christmas home tour, Yvonne! 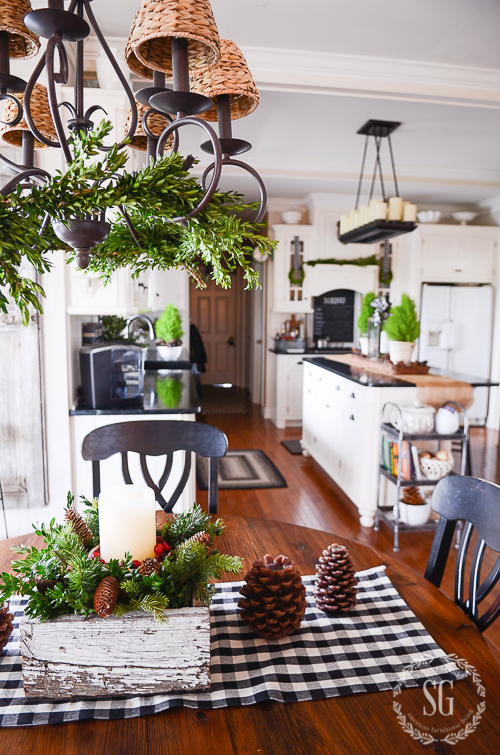 I was so looking forward to your Christmas decorations and home tour, and you did not disappoint! 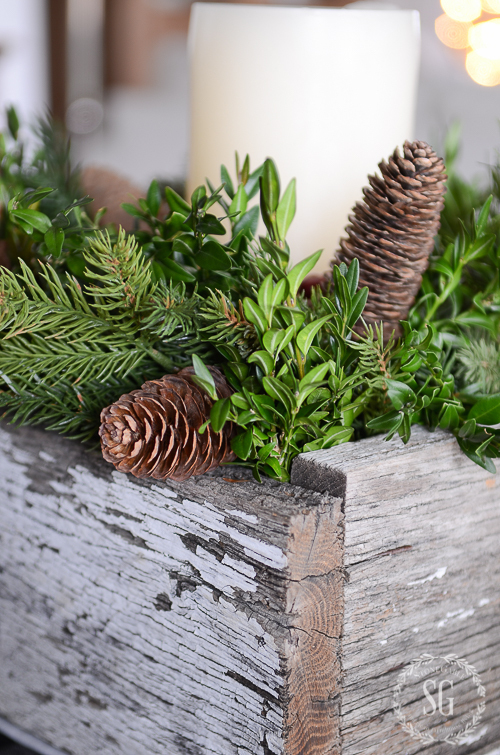 Thanks for sharing so many great ideas…..hope you have a Merry Christmas! I just love the visit today and came away with some great inspiration. I especially loved the aprons. What a wonderful idea. 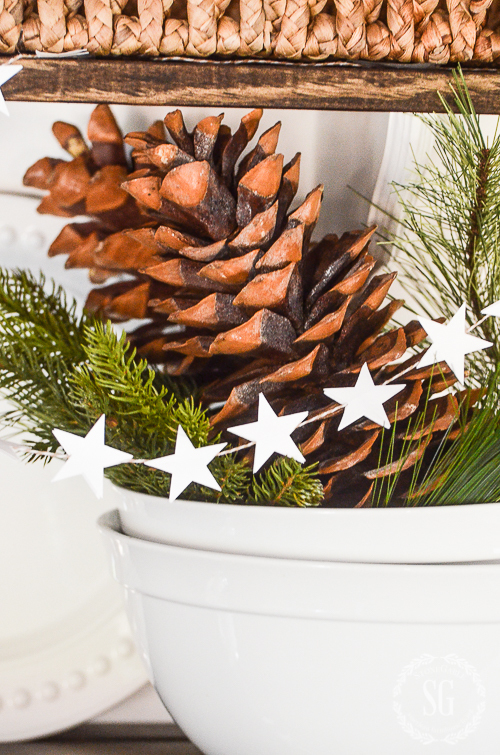 How do you make the star garland? Stunning. I love a traditional Christmas and yours is beautiful. Such attention to detail and so much inspiration. Beautifully done.